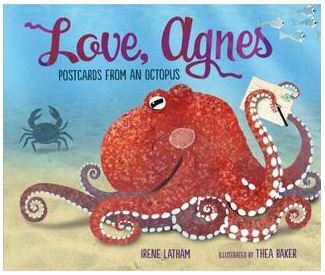 Agnes, a Northern Pacific giant octopus, finds a postcard underwater and begins a series of postcard correspondences with a number of creatures above and below the waves. The illustrations are very lifelike, as is the life cycle story of Agnes as she locates a safe place to lay her eggs and cares for them. I enjoyed the artwork and lifelike depiction of the octopus’ life to its conclusion when the eggs hatch and she fades to white and dies. The postcards didn’t add a lot for me, but do sneak in some real information about the octopus and its neighbors. The last pages give more information about octopuses and a list of suggested reading. 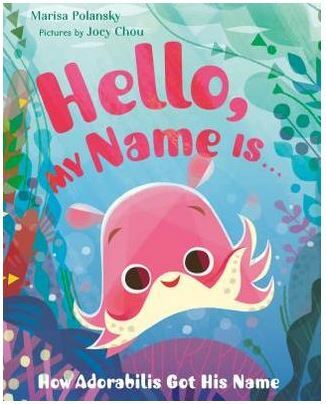 VERDICT: Children who enjoy a lifelike story that ends a bit sadly/realistically will enjoy the illustrations and story of the life and death of this cephalopod. It isn’t a very upbeat story, so readers looking for a fun picture book might pass this one by. February 2019 review by Lynne Wright. This book allows us to learn how to create a story while having fun with the plot. It starts with showing that a character is needed to start a story, then suggests some cute ideas with graphics. 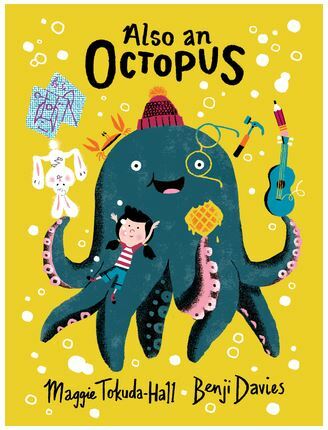 The octopus becomes the character, and it gives a sense of humor by tossing out ideas like… it plays the ukulele. Or if it wants something added to the plot… maybe a sandwich! The text takes the reader on journey of possibilities on where the story might lead this octopus and the graphics are full of fun and humor. The child I read this to kept chiming in with ideas and laughing about the pages of silly animals. It really kept the child engaged with story ideas. VERDICT: Children will enjoy the process in making the story their own and seeing how the path can change. It sneaks in story creation but the journey will be full of fun. The book itself is a fun adventure, even if the reader isn’t interested in making their own story.